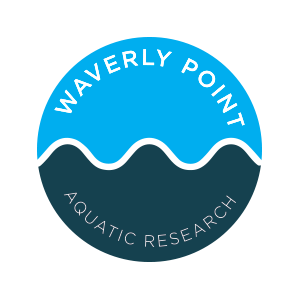 RESEARCH — WAVERLY POINT OYSTER CO. The Chesapeake Bay oyster population declined nearly 99% over the last 130 years. This puts stress on the environment and ecosystems living in the Chesapeake Bay. One of the main causes for how it affects the bay is that there is more nitrogen in the water ways. Although we support consuming oysters, we also keep in mind that oysters are one of the most important species for the waters. Our One for One Initiative™ aims to support eating oysters in an environmentally friendly way. The Chesapeake Bay is an estuary, located on the mid-atlantic coast of United States, where the inland freshwater streams meet the open ocean. This rich exchange of waters, combined with shallow depths, makes estuaries the most productive natural habitats in the world. The Chesapeake just so happens to be the largest and most productive in North America and is home to some of the world's most delicious oysters because of the salinity levels it produces. Our farm is located on one of the most cleanest rivers on the bay, The Great Wicomico. This river gets amazing water flow from the bay thus creating a unique habitat for ecosystems in the river. The Great Wicomico River is a tributary on the western shore of the lower Chesapeake Bay. Located 10 km south of the Potomac River and 25 km north of the Rappahannock River, the GWR is a small watershed consisting predominantly of forested and agricultural lands (Southworth et al., 2010). The GWR is considered a trap-type estuary with water circulation patterns that contribute to its history of significant natural oyster recruitment (Andrews, 1979; Southworth et al., 2010) Contrasting to other rivers, the Great Wicomico does not experience the run off and pollution hence why it was chosen for a Habitat Suitability Index (ACOE & VMRC). Salinity is a measure of the amount of dissolved salts in the water. It is usually expressed in parts per thousand (ppt) or the number of grams of dissolved salts present in 1,000 grams of water. Salinity varies widely from season to season and from year to year, depending on the amount of fresh water flowing from the Bay’ rivers. The Bay tends to be fresher in spring, when snow melts and heavy rainstorms are frequent. During drier months, the Bay is usually saltier. The eastern oyster (Crassostrea virginica)—also called Virginia oyster, or American oyster—is a species of true oyster native to the eastern seaboard and Gulf of Mexico coast of North America. We specialize in farming the Triploid oyster. Triploid oysters have an extra set of chromosomes compared to the usual diploid oysters which have 2 sets. These oysters are generally more sterile and grow faster than diploids. Triploids are also more resistant to disease. Aquaculture is the farming of fish, crustaceans, molluscs, aquatic plants, algae, and other aquatic organisms. Oyster farming is the most environmentally friendly form of seafood farming, all they need is clean water. Our farm is tractor free and livestock requires zero feeding. Oysters are at the bottom of the food chain, filter-feeding on plankton and algae. 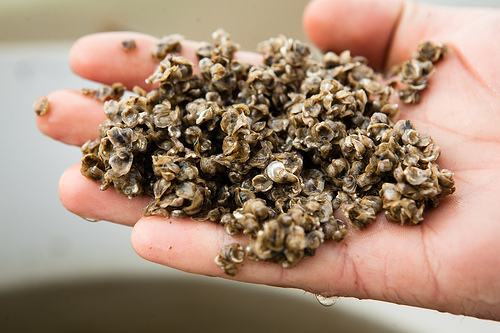 Oyster gardening starts with baby oysters called "spat". These small oysters are born by a special process of sexual reproduction unique to oysters. We have partnered with local companies specializing in farming spat. Throughout time (within a couple months) these baby oysters grow inch by inch and within 12 months they may be ready for market. Similar to other farming practices, oyster farming maintenance is required. Labor intensive work is done to keep oysters healthy by giving them enough space for growth. Naturally oysters will grow together forming multiple oysters. Human force can pull these oysters apart from each other so they can individually grow in their habitat. Oyster harvesting is a labor intensive process in which we pick out the market ready oysters to be sold to restaurants, you, or at events. Although many people enjoy eating oysters in colder water (70 degrees or less), these disease-free triploid oysters can be consumed year around. Once they are harvested, we ensure that they are properly rifridgerated until delivered to location. We scout ecosystems, collect data, and find new ways to increase species population by using modern technology. HELP PRESERVE THE CHESAPEAKE BAY! Check our progress ON INSTAGRAM!